Chef Rocco DiSpirito brings some delicious recipes from his new book "Rocco's Healthy + Delicious" including a fast Veggie Pasta Pomodoro, Turkey Sliders, & No-Bake Chocolate Chip Cookies! Italians are champions of simple, classically delicious ways of using fresh tomatoes. And they should be; they’ve been cultivating them for hundreds of years. One of the many basic ways they prepare garden-fresh tomatoes is in a pomodoro sauce made with basil and garlic tossed with pasta (or in this case, spiralized vegetables). Cut the ends off of the zucchini, squash, and carrots. Using the instructions with your spiralizer, cut the vegetables into long angel hair–shaped pieces. 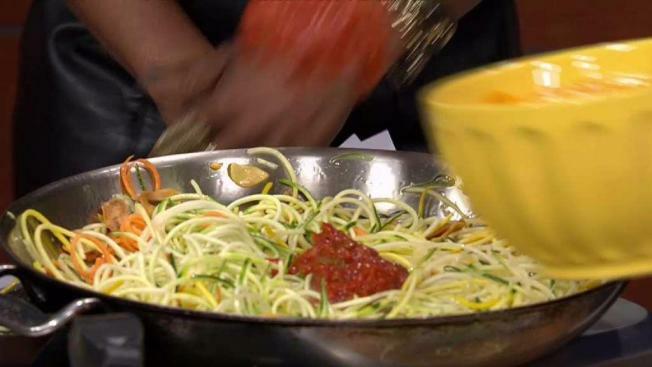 In a bowl, mix the squash and zucchini noodles together and lightly salt. Set aside to drain. Place a portion of pasta on a microwave-safe plate and heat for 30 seconds to warm through. (Repeat for all the portions.) Top with the pomodoro sauce, the remaining basil, and the Parmesan. For light snacks or sports-watching treats, some good old artery- clogging, fat-packing standbys are sure to please. But why not try some healthier finger-food options. Instead of beef sliders with cheese, for example, try my turkey sliders with their special jam, all wrapped in large lettuce leaves. Cook the chopped tomatoes in a medium saucepan over medium-high heat until they are broken down, thickened, and most of the liquid has evaporated,. Stir in the tomato paste, vinegar, and monk fruit. Set the tomato jam aside. In a large bowl, combine the puffed rice and water and use your hands to break up the puffs. Add the ground turkey, season with salt and pepper, and mix well to combine. Form into 8 slider-size patties and place in the freezer for 10 to 15 minutes to firm up. Grill the sliders until well cooked, about 5 minutes per side. Transfer to a plate to rest. To serve, place a slider in the center of a lettuce leaf, top with the tomato jam, and wrap the leaf around it like a package. Cookie dough served up in a dish is all the rage where I live. Well, this recipe is just as good. You mold the batter into cookies, but it’s okay if you take a few swipes with your spoon, too. In a medium bowl, combine the shredded coconut, almond meal, almond butter, vanilla, chocolate chips, and coconut nectar and mix well with your hands. Form into 8 balls, then press into round disks with the palm of your hand.